I finally saw Pontypool last night. OK, you could make some arguments that it falls apart a bit at the end. And I'll tell ya, the thing at the very very very end? After the credits? I have no idea what that was. "It's a zombie picture, but we spend the entire time inside a radio station -- you know, because radio stations are so photogenic. Anyway, we never really see more than a couple zombies even though there's a zombie uprising -- destroying houses, medical buildings, all kinds of stuff like that. Instead, we just hear about the holocaust from people who call into the radio station. We don't see them hardly at all!" As a producer I'd just say "Uh. No." But it's great at being a movie. I'm an hour into the movie when I realize that I haven't seen a single zombie yet. And we're gripped in the middle of a zombie holocaust. The way people go zombie is beautifully horrific. There's this amazing moment where a girl is in the late stage before she starts killing and she's just standing in the half light emitting a single note from her voice which is seriously one of the creepiest things in any movie. Indeed, there is a radio play of the book too. I agree 100% -- Pontypool is terrific... until it falls apart at the end. One more pass at the third act, that's all that was needed. And of course that picture grossed less than $5K at the N. American box office. I mean you and I have done vastly better than the producers of that poor flick. Sheesh. Picked it up on DVD, too, and I can't disagree with what you've said. Flew off the rails some at the end but they did an amazing job setting up a single setting, barely-see-any-zombies zombie movie. I haven't read the book, but I would suspect getting the whole zombie-infection spread through language is something that is much easier to get across actually using the written word, which - in addition to being trippy - is one of the reasons the ending might have failed. And it has genuinely creepy zombies. I mean, when people went zombie it was a super creepy thing. Even better -- we only SEE one person go zombie. That's freaking amazing. I do wish they'd recalled the French message -- the "Do not translate this message" just a bit earlier. The Canadian politics of it... well actually I don't think there were any. It might have been interesting if the Doctor was Francophone. Or maybe not. Eventually I'm going to listen to the radio play because I bet that's cool. Maybe the third act could have been solved by each person having an "antivirus" word? Or maybe we just cut to 6 months after the holocaust and everyone has learned to be silent. Or maybe they put up signs at the Canadian border than only French and non-English languages may be spoken in public and private places. English may be used on signs and written communication. I've done exactly the same thing. The solving problems for already released movies, not the turning into a zombie bit. I wonder if the zombie creepiness is in part because we can still "see" some humanity in them. After all, these aren't the risen dead as much as living people who have kind of gone insane. And yes, they should have gotten much more creative with the ending, especially considering who terribly absurd the concept is. Personally, I've always found the "everybody dies" ending to be a huge copout anyway but that's a whole other can of worms. I feel like the only reason we want to solve the third act is because THE REST OF THE MOVIE IS SO DAMN GOOD! I mean every scene in that thing was compelling. Even when it went off the rails. That word repeating thing is just somehow unnatural. It's just a bit ur-frightening. Maybe because communication is so key to human understanding that when it breaks down fundamentally it's terrifying. I don't know, but dear Lord that movie should have made more money. Speaking of Zombies and radio shows. Have you heard of "We're Alive". It's a web distributed podcast or "radio" drama. High quality. You can check it out on their website or via iTunes. Just search for "We're Alive." Each of their 18 chapters is broken up into 3 parts that total about 45 minutes. I've only listened to the first two so far. I'll check out "We're Alive". 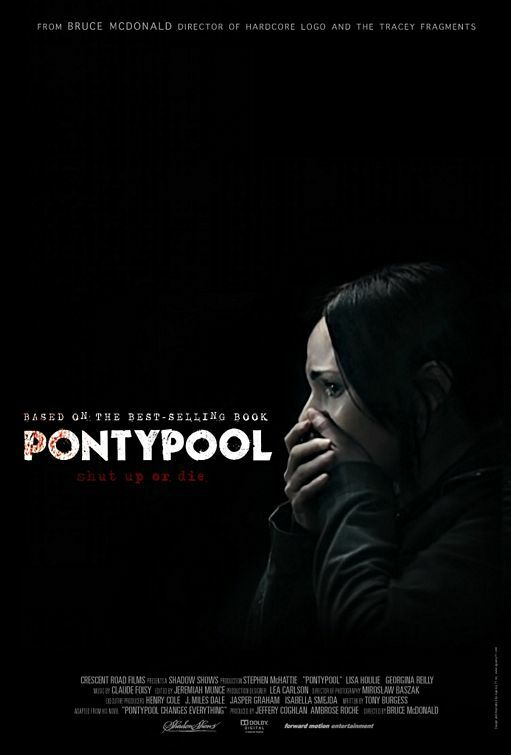 Hey, the end of the radio-play version of Pontypool is better than the movie version. It still isn't as satisfying as I'd like but it's a tad better. I saw the film about a year ago, so I'm trying to remember details as I write this. I agree, the beginning was captivating, and then it falls to pieces in the end. There are two things that bother me about the movie, and in looking back, I think they work in tandem. Firstly, the idea that language is spreading the zombie/crazy person infection is a bit hard to swallow, but I'll go with it. What made me lose my lunch is the cure. To prevent zombification, insanely rant metaphors until desired effect is achieved. I think it would have been a better film if there were no cure, other then silence that is. Like I said, the radio play has a more satisfying (and darker) ending. haven't seen pontypool yet, though i intend to grab it on dvd. i had the opportunity to work with bruce last summer and he is just about the nicest guy you'll ever meet. he is utterly unaffected by the industry and his (by canuck standards) fame. Yeah, I enjoyed it up til the end. That lead guy has a great voice, and the whole sombrero thing reminded me of MacReady.